Snow & fog then bluebird days @ Grand Targhee. As you may have heard, the snow situation in the West right now is terrible. Here in Salt Lake City, we haven't had snow fall since Christmas Day! There has been some snow in the mountains, thankfully, but nothing like we usually have this time of year. Even though this unnaturally warm weather is freaking me out big time, I am sort of loving all the trail running that I am able to do because of the complete lack of snow. When we planned our ski vacation to Grand Targhee, I wasn't worried about snow accumulation as is usually the case in the western US, we get our heaviest snow months in late January, February, and March. As our trip got closer, though, and we didn't get that expected snow, I was worried! But it turns out that, although they are still well below normal, Targhee has some of the most snow in the West at the moment. 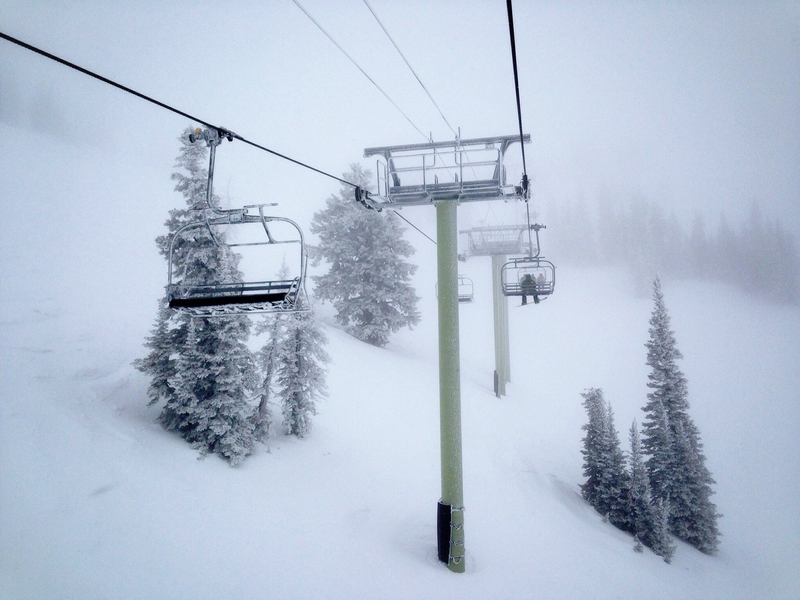 We arrived to Grand Targhee resort late Monday night and woke up Tuesday morning to fog and snow. 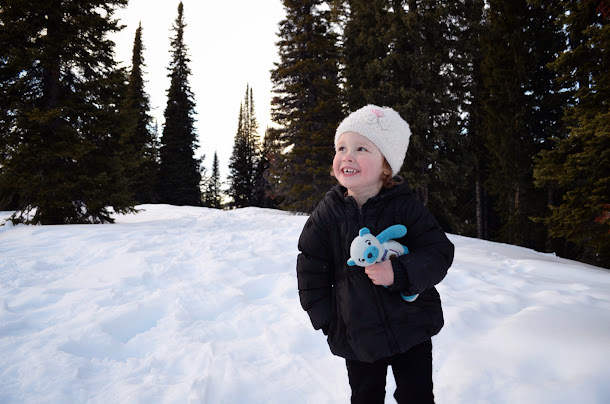 We stayed on the mountain so it was easy for my dad and step-mom to take Alice out on a snow adventure while Lee and I skied/snowboarded together for a few hours. Despite the fog, the conditions were great! And it was so nice to have time together doing something that we both love. Wednesday and Thursday were perfect bluebird days and my dad and I hit the hill early so that I could snap a few pictures of the Tetons. As we got off the lift and traversed over to the viewpoint, my mouth dropped open as those spectacular peaks came into view. And just my luck! There wasn't a cloud in the sky to obstruct the view or my picture-taking. 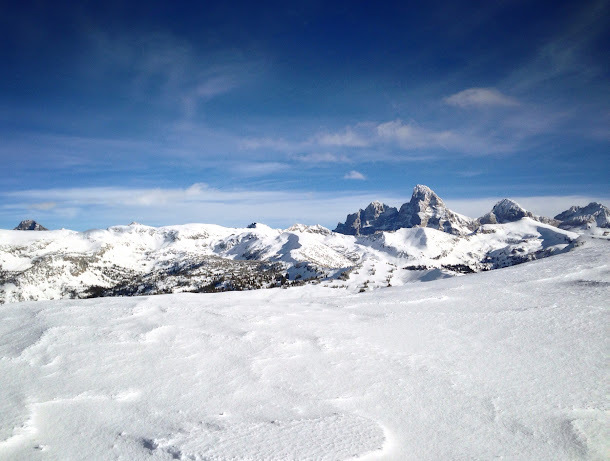 It's worth going to Grand Targhee just to see the view of the Tetons from up there. My dad and I skied together for the rest of that day and the next, racing each other to the bottom and scoping out the best next run on the lift ride back to the top. 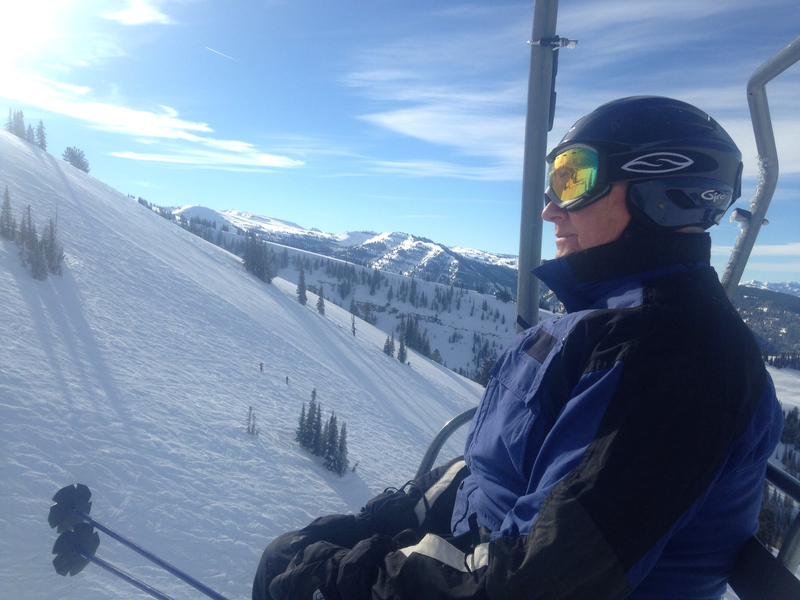 It was so wonderful to ski with my dad as we hadn't skied together in over 20 years! And it was so wonderful to fall in love again with a sport that my dad taught me to do when I was just Alice's age. Speaking of Alice, she wasn't too keen to try skiing this trip. 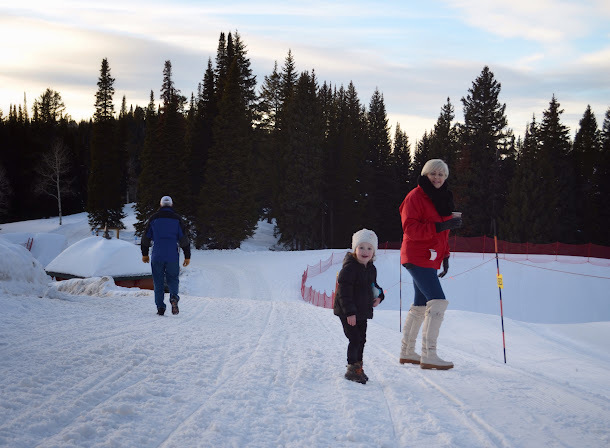 She put on her ski boots, tromped around in them and rode the magic carpet but she wasn't at all interested in clipping in to her skis for a scoot down the hill. We didn't push her to do it, either, as we didn't want to create a situation where she fears learning to ski. Because my dear Alice,you will definitely be a skier someday. On our last night in Targhee we took a sleigh ride to have dinner inside of a yurt! 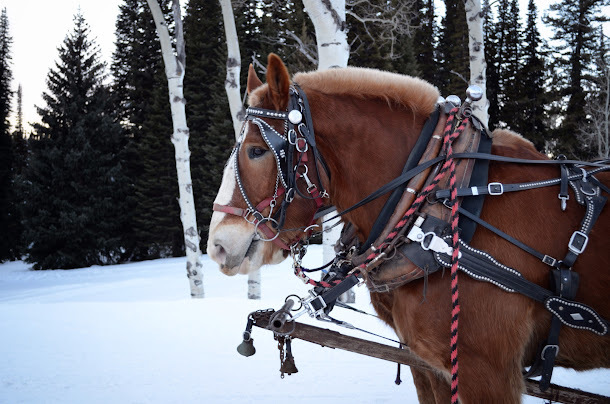 Alice loved riding the sleigh while the big Belgian horses pulled us through the woods to the snow-covered yurt where our dinners were being cooked on wood-burning stoves. We devoured the freshly made scones with honey butter and our host kept piling our plates full with chicken, steak, vegetables, and mashed potatoes. He even tried to serve us each two pieces of cheesecake! 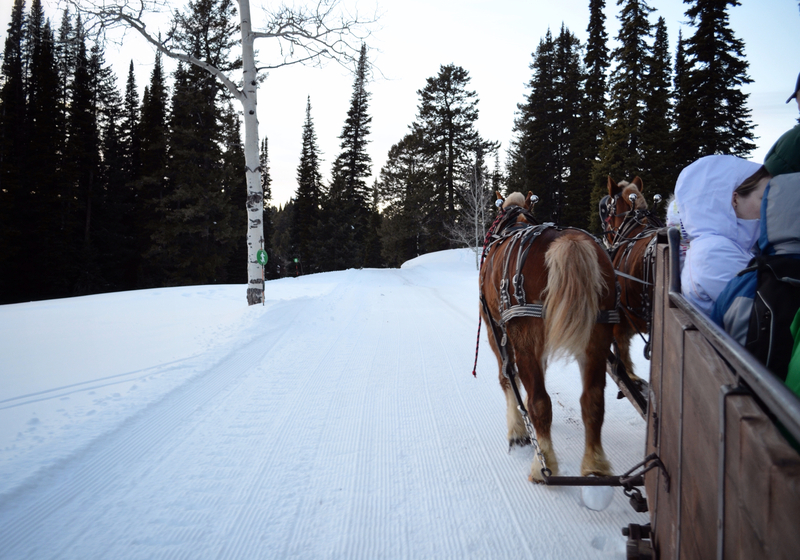 I'm sure the horses felt the extra weight of our full bellies on our return sleigh ride to the resort. 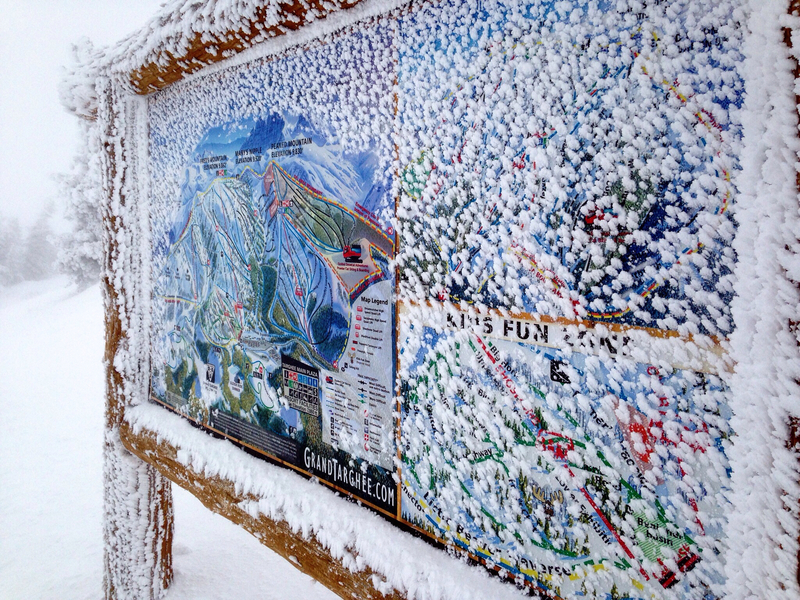 Do you ski or snowboard? I've skied since I was 3 and then picked up snowboarding when all of my friends did at 16. And after exclusively snowboarding for 8 or so years and then only skiing this week, I don't think I'll ever strap a snowboard to my feet again. I just love skiing so much. 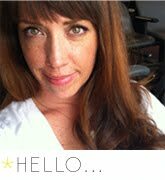 Weekly Workouts: Monday - CrossFit! Front squats 3 x 3 @ 80% (118lbs), then 5 RFT of: 200m run + 10 power cleans (65) + 10 front rack walking lunges (65). 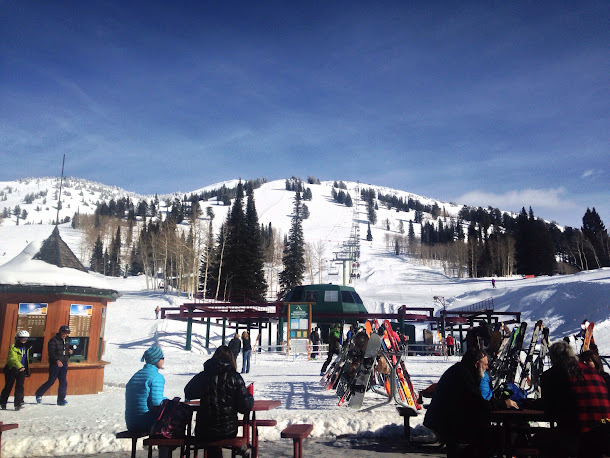 Tuesday, Wednesday, & Thursday - Ski days!! Friday - Rest day. 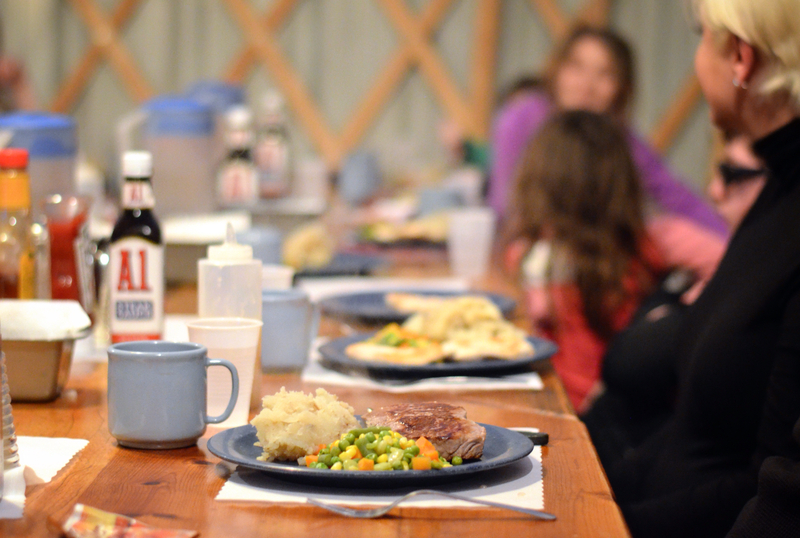 Scenes from the sleigh ride & dinner in the yurt! Wow, that's a pretty awesome snow vacation! 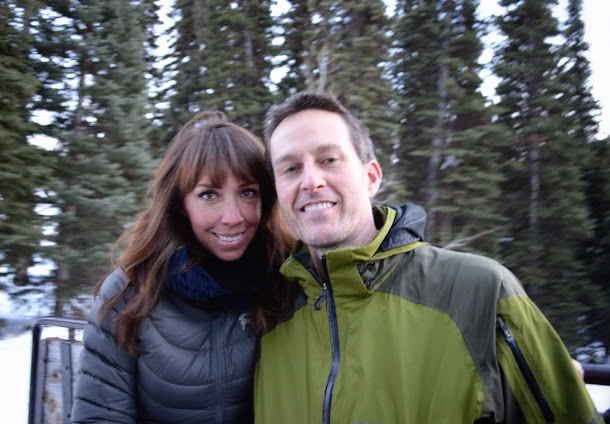 I can't wait until baby #2 is a little older so I can get back to skiing or snowboarding. We've been up once this season (and we're going again in March!) but I won't be on the slopes. I'm sitting pubside/coffeeshopside with the baby. Our older child is potty trained now and we put him in ski school (expensive!) and he did great! Now we just need to find him some friends to ski with. It looks lovely. The hardest part of this "polar vortex" we are having out east is that there is no mountains to ski (and not enough snow). Nolan will be a skiier as well. He got up on some tiny skis last year in Austria and loved it. Our plan was to take him this year, but the local hills in WV just don't have enough snow for us to drive out there. I love skiing and I really miss it this year but I will be back on the mountain next season! Hopefully we have better snow fall next winter! It looks like you had an awesome trip. The mountains look stunning. 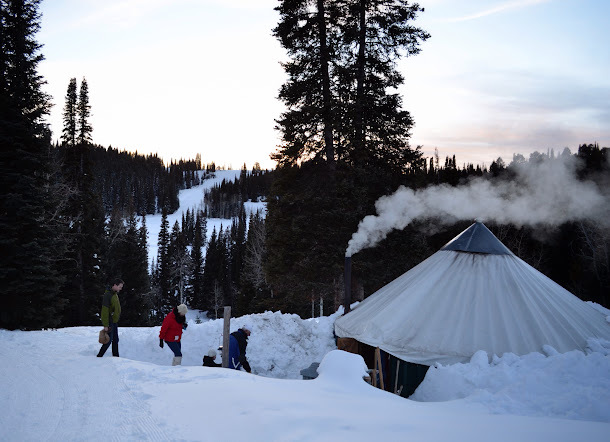 I've always wanted to do dinner at a yurt and I love that you guys took a sleigh ride - I bet Alice was in heaven! She is so adorable and getting so big!